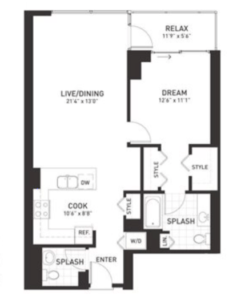 Looking for a luxury apartment for rent that won’t break the bank? Here are some of our top picks netting under $2000! 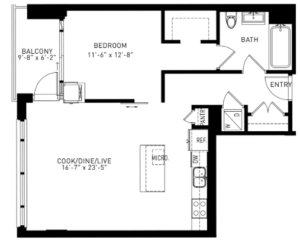 Looking to Rent in Printer’s Row? 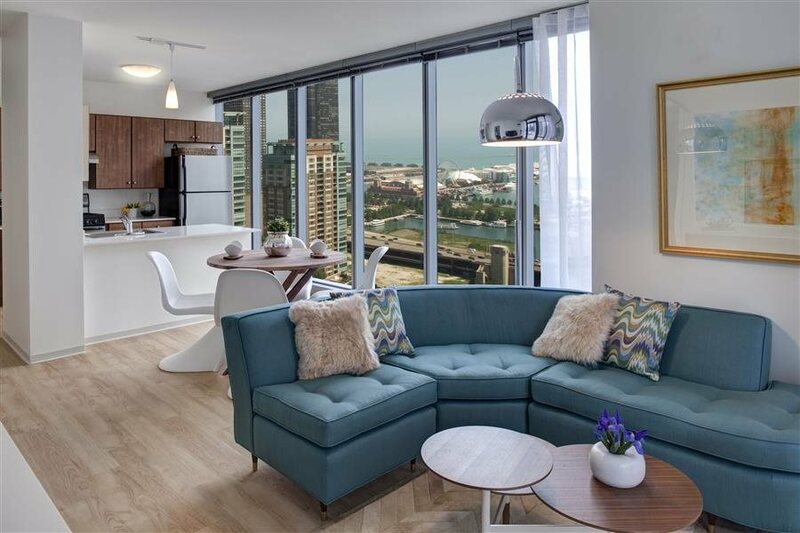 This fall and winter Printer’s Row is absolutely filled with great deals on luxury apartments for rent. Here are a few stellar deals that really stole the show this week! This luxury apartment features large windows, white quartz counter tops, a gas range, garbage disposal, Nest thermostat, in-unit laundry, hardwood floors, and stainless appliances. 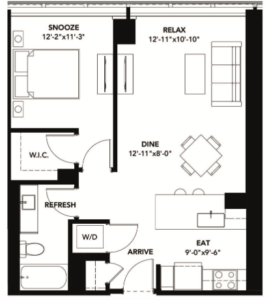 Community amenities include a rooftop terrace and pool, spa, 24-hour door staff, and even a bowling alley! Property 135 also offers on-site dry-cleaning and tailoring services as well as direct access to Dollop cafe and coffee shop. Between the dog run and abundance of nearby green space, this rental is a great option for pet owners. Modern finishes include designer Italian cabinetry, a rain shower and Grohe faucets in the bathroom, in-unit laundry, hardwood floors and a large walk-in closet in the bedroom. 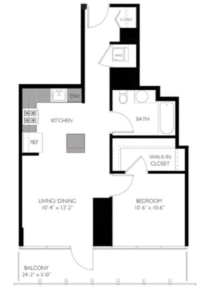 At 850 square feet plus a balcony, there is plenty of room for entertaining. If you’re bringing large furniture pieces such as an L-shaped couch, dining table, or king sized bed to your new apartment, property 18 could be a great option for you! Do you entertain often? 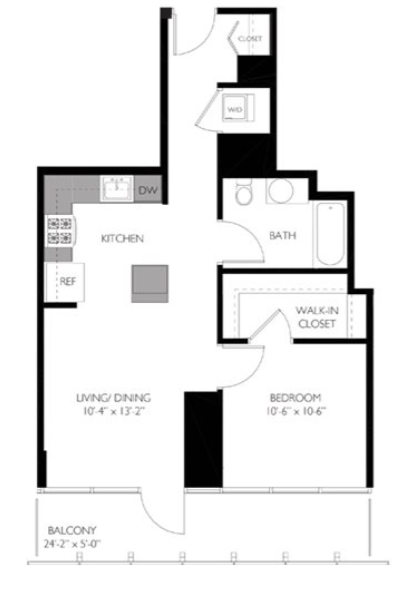 Between the extra half bathroom by the entry, spacious balcony, kitchen island seating, and a living room large enough for an L-shaped couch plus 8 person dining table, property 14 is ideal if you plan on having company. Certainly. 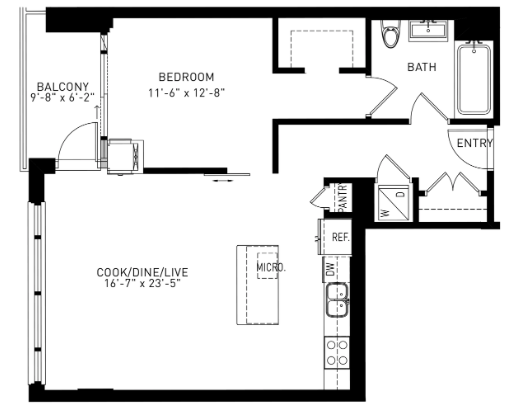 at 908 square feet, this apartment is one of the more spacious 1 bedroom layouts in the market. 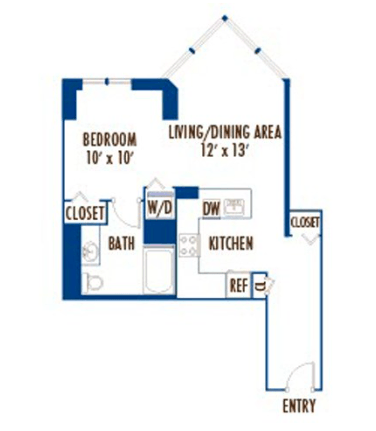 Additionally, notable features include 9 foot ceilings, in-unit laundry, and 2 walk-in closets in the bedroom. This pet friendly building also offers a dog run. Looking to Rent in Lakeshore East? 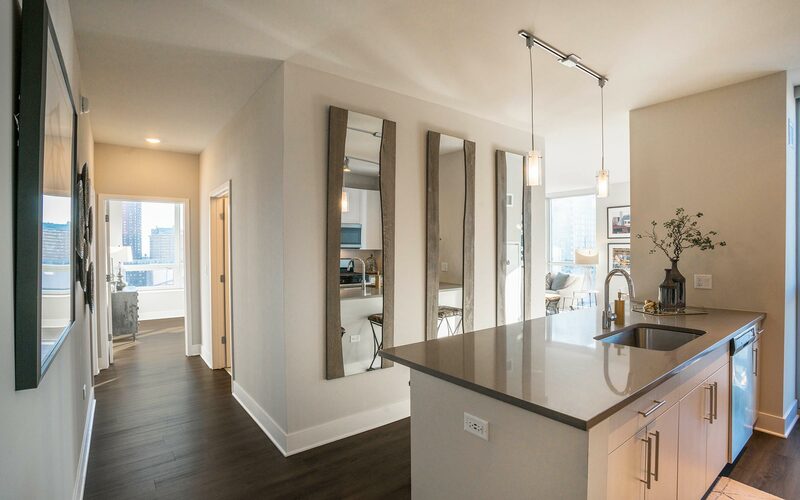 This Lakeshore East 1 bedroom apartment features a modern kitchen with quartz counter tops, stainless appliances, and a gas range. The large balcony is great for entertaining and offers sweeping views of downtown Chicago. 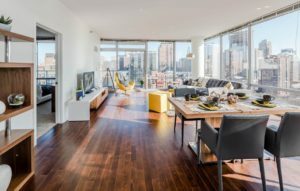 This apartment features in-unit laundry, ample closet space, hardwood floors, and floor-to-ceiling windows. Better yet- the rent price includes heat, air-conditioning, internet, cable (Showtime & HBO), gas, sewer, water and trash removal. 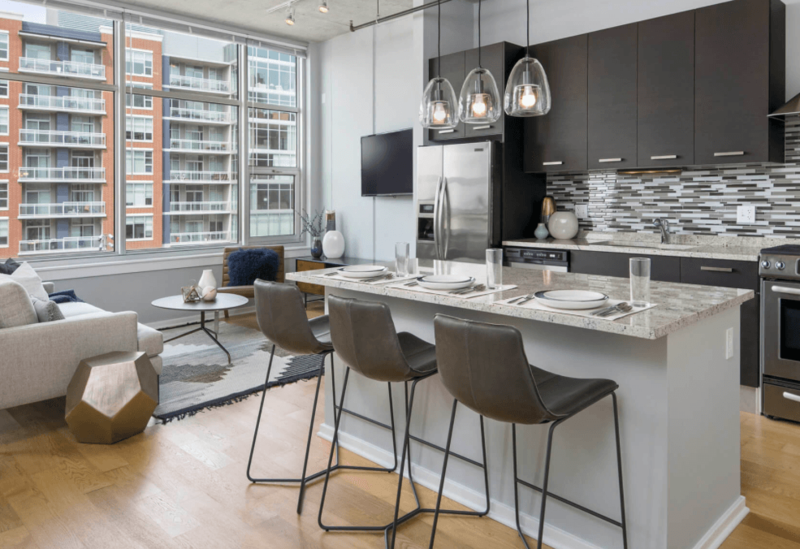 Looking to Rent in the Fulton District? The Fulton District joins the River North and West Loop neighborhoods. If you’re looking for a great value for rent in a prime location, check out this Fulton District convertible. This apartment features in-unit laundry, granite countertops, a kitchen island, and large windows to maximize natural light. In addition to a large, 2-room fitness center, landscaped terrace, and billiards room, this apartment building offers a multitude of convenience-based features and services such as a resident coffee bar, co-working space with printing, door staff, and on-site dry-cleaning and bodega. For more information on luxury apartments for rent within your price range, contact us today. We’d be happy to keep you in the Loop!